Test crash logs are captured. 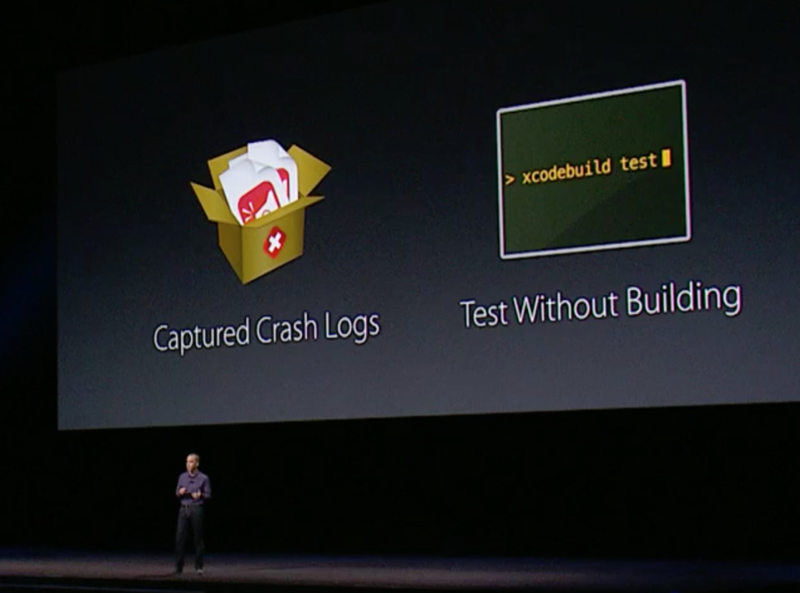 xcodebuild can now run with pre-built tests. Indexing tests is now 50x faster. Have you ever ran a test, unit or UI, that triggered an app crash? It just happened to me today. I bug when animating a UIPresentationController surfaced on iOS8. Unfortunately, Xcode 7 doesn’t capture crash logs when a test triggers a crash. Instead, you have to go back, re-run the test several times, set some breakpoints, and hone in on the code that caused the crash. Luckily, this is changing in Xcode 8 as crash logs will automatically be captured when a test crashes. This means you’ll instantly know the offending line of code that caused the crash, and will be able to fix it that much faster, and move on to building other pieces of your app. There’s no way in Xcode 7 to provide a pre-built bundle of compiled tests to be executed against a new instance of your app. This is changing in Xcode 8 with the new xcodebuild. You’ll be able to specify a pre-compiled bundle of tests to be run against a freshly-compiled instance of your app. This has the potential to vastly reduce your compile times. By default (at least in Xcode 7), all of your tests will go into the same target. Each time you need to run your tests, your entire app and all the tests will be recompiled. This isn’t always efficient, especially if there are pieces of your app that haven’t changed. With this new feature of Xcode 8, you’ll be able segregate these tests on their own, so that they can still be run, but they don’t have to be compiled. Awesome. In Xcode 7, it’s really frustrating when I open a project in Xcode, and I have to wait several minutes for Xcode to finish “Indexing” my tests before I can run them. Have you experienced this? Seeing that I’m only working with a couple projects at a time, and the number of my tests creeps up slowly as I work on the projects, there really isn’t a huge cliff where performance all of a sudden drops off. Instead, one day, it will catch my eye that I noticed the indexing took longer than usual, or got in my way from actually performing a build. Then I wait. And eventually I can resume what I intended to do. I was happy to hear that in Xcode 8, Apple has vastly improved the performance of this indexing process. In the Platforms State of the Union, it was stated that there is a 50x speed increase when tests are indexed. I can’t wait to experience this in my real projects during my day to day development. It’s been great to watch how Apple’s support of automated testing has evolved over the years, and these three new Xcode 8 testing features continue that trend. You can measure tangible jumps in automated testing support with each WWDC since the iPhone’s original introduction. I can’t wait to see what else the rest of the week holds with regards to further enhancements to testing in Xcode 8.